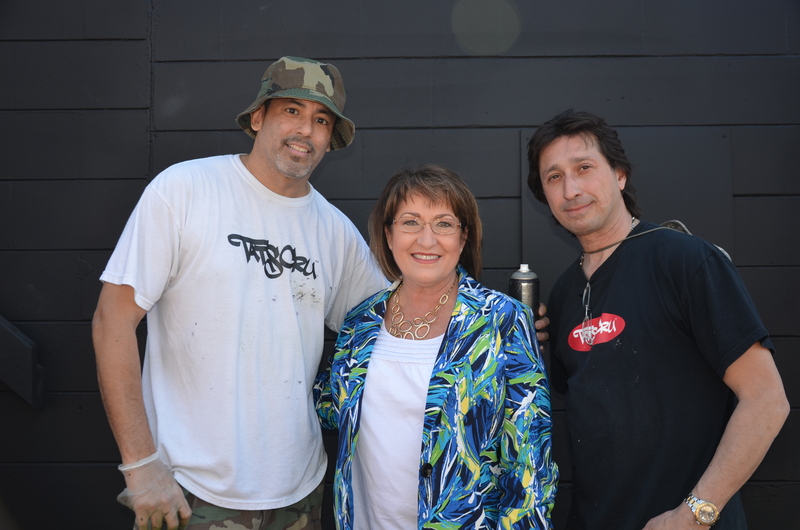 Orange County, FL – Orange County Mayor Teresa Jacobs joined the Azalea Park community on Saturday as citizens welcomed a new mural honoring baseball legend Roberto Clemente at the historic Azalea Park Little League field. Mayor Jacobs also thanked Earl Lugo, Azalea Park Little League advocate, for his efforts in bringing his friends New York artists Hector “Nicer” Nazario and Wilfredo Feliciano back to Orange County to design the new mural. Mayor Jacobs was joined by Orange County District 3 Commissioner Pete Clarke Commissioner, District 2 City of Orlando Commissioner Tony Ortiz, and other community leaders during her proclamation of March 15, 2014 as Roberto Clemente and Azalea Park Little League Day in Orange County. The Orange County Regional History Center staffed the event with young volunteers and provided information about its recent Roberto Clemente exhibit at the well-attended community celebration. Lugo said the vast support from local officials and the business community has boosted community pride in Azalea Park and its little league. Several weeks ago, the mural received significant media coverage when it was painted over, unbeknownst to the community and little league organization. Since then, Orange County’s business owners and community leaders have rallied assistance and other resources toward the restoration of the mural. In March 2002, the Orange County Board of County Commissioners awarded Azalea Park Little League a $125,000 Field of Dreams grant. The league was also awarded a ReNew Hurricane Repair Grant in 2005 for $49,800. In an effort to build community morale, little league coach Earl Lugo recruited Nazario, a spray paint artist from New York, to create a mural of Roberto Clemente at the field in 2011. The Azalea Park Little League field, at 53 years old, is one of the oldest little league fields in Florida, and sits adjacent to Azalea Park Elementary. A variety of photos from the event are available for use by the media and are located on Flickr.